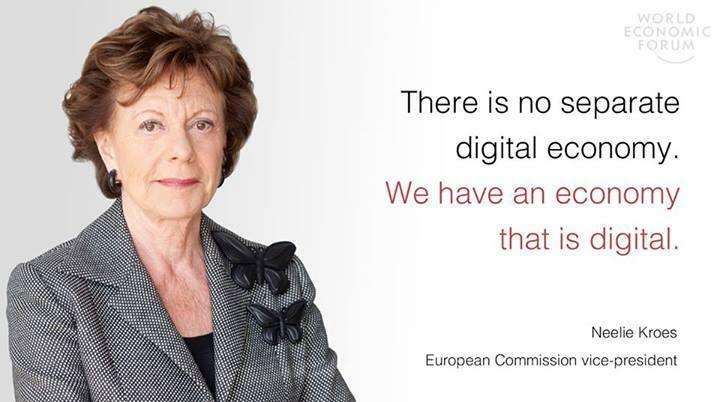 I agree fully with the statement that we cannot have a separate digital economy, and I see what Kroes means when she says that “we have an economy that is digital”. We have however not reached the goalpost of calling our economy truly “digital”. Governments have not enabled that full transition, and the foundations of our economy are still made of thousands of disconnected pockets of digital success. There is a significant difference between an agenda (a to-do list) and the final implementation of a vision. When we were talking about the Digital Agenda in 2009, the to-do list contained a number of enablers for the digital economy. And the scoreboard shows a relatively successful execution. But there is still road ahead. The OECD has recently acknowledged this significant progress in the “digitisation” of the economy: shortening supply chains for customers (e.g. through eCommerce), and reducing economic burdens (e.g. unrecovered VAT) for businesses. As millions of people move around Europe, across national or EU member state borders, they are mostly settling in cities. However the cities as we imagine them, the ones buzzing with life, such as Amsterdam, Barcelona, Berlin, London and Paris are significantly few. These very large cities exist only in 14 of the 28 countries of the EU, and less than 25% of the EU’s population live in them. There is a significant number of cities housing a population of 500,000 or less, indeed about 60% of people live in these cities. Yet when we talk about a digital economy to the 500 million citizens of the EU, they expect smart cities to be the immediate future. These expectations are the challenge of a vast majority of local governments in municipalities across the EU. There is a significant difference between Barcelona and London, but they still both have economies of scale. The same cannot be said for small cities, or also of small countries like Cyprus, Malta and Luxembourg. I base my observations on a factual European Commission report downloadable from here. big public spending that prefers suppliers who are active in a collaborative workspace with SMEs, governments, the third sector, academia and also engaging the end-customers. We can observe fragments of this sort of thinking in many places of European policy. But by 2020 Europe must show the real value of the European promise, beyond the funding mechanisms. We need a solid commitment towards scalable, common, re-usable solutions that will improve the quality of life of the man in the street: for the 60% of people living in the smaller cities, for example; but also for the 25% who decided not to live in Europe’s urban areas. ← What’s behind the smile?